Minor Spoilers: proceed at your own risk. Hidden Figures is the best movie I’ve seen so far this year, and it deserves to win a few Oscars. Hidden Figures tells the story of three African-American women who worked for NASA in the early days of the space program. Taraji P. Henson from Person of Interest and Empire plays Katherine Goble Johnson, a brilliant mathematician. The real Dr. Johnson celebrated her 98th birthday last summer and was awarded the Presidential Medal of Freedom in 2015. Octavia Spencer plays Dorothy Vaughn, unofficial supervisor of the “Colored Computers” pool, who has the duties of a supervisor, but neither the pay nor the title. Janelle Monáe plays Mary Jackson, a mathematician whose supervisor wants her to train to be an engineer … something impossible for a Negress in Virginia in the 1960s. Hidden Figures is a movie about overcoming prejudice. Hidden Figures is a love story between a handsome colonel and a beautiful mathematician. Hidden Figures is a portrait of the problems of working mothers (both single mothers and women with husbands to help them). 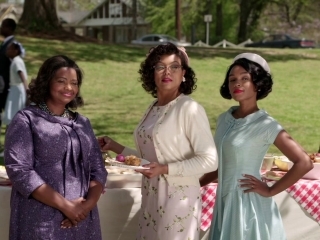 Hidden Figures is a window into the past, to a time not very long ago, but very different. It’s important as a glimpse into the past: Mrs. Vaughn being escorted from the public library when she goes into the white section instead of the colored section, white and colored water fountains, segregated busing, segregated bathrooms, dial telephones, a courting couple waiting until they’ve known each other for months before their first kiss, computers being a new, strange, and incredibly bulky thing. For the modern generation, who’ve gotten working calculators as Happy Meal toys, the lack of electronic computers may be the hardest thing to comprehend. Kevin Costner (Dances with Wolves, The Untouchables) does a great job as Al Harrison, Katherine’s boss, who desegregates the bathrooms when he learns the reason Katherine takes such long breaks is because the nearest Colored Women’s bathroom is in another building, half a mile away. Jim Parsons (Big Bang Theory) plays engineer Paul Stafford, who looks down on Katherine not only because she’s Colored, but because she’s only a computer. 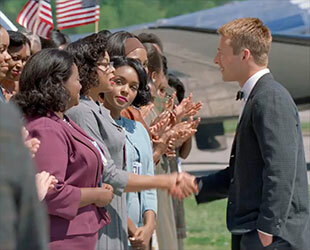 Astronaut John Glenn is portrayed by Glen Powell, who looks at Katherine as though he’s fallen in love when she solves a complicated equation in front of him, and when the new IBM computer has problems, he requests that she double-check its math. Mahershala Ali plays Colonel Jim Johnson, the man who falls in love with Katherine, and Aldis Hodge from Leverage plays Mary’s husband, Levi Jackson. Hidden Figures is one of the best movies I’ve ever seen, and I cannot recommend it too highly. If you’re a parent, you may want to set the stage for your children by explaining some of the background first. You’ll definitely want to discuss it with them afterwards. I can’t wait until this comes out on DVD, because I want to own this one, and I’m definitely going to the library to see if they have the book it’s based on, Hidden Figures: The American Dream and the Untold Story of the Black Women Mathematicians Who Helped Win the Space Race, by Margot Lee Shetterly. Actress-singer Tammy Grimes died Sunday, October 30, 2016, in Englewood, New Jersey. She was 82. Her theatrical career spanned — and soared — over half a century. Her two most celebrated roles were as the unsinkable Molly Brown on Broadway and as the voice of Molly Grue in the animated feature The Last Unicorn. Tammy Grimes was a star of the legitimate theater, but far from unknown in movies, television, cabaret performances, and doing voice-overs. She recorded several record albums. She won two Tony Awards, one for originating the role of Molly Brown on Broadway, a part Debbie Reynolds played in the movie version, and one for starring in Noël Coward’s play Private Lives. She also won an Obie Award for her performance in Clerambard and a Theatre World Award for her work in Look After Lulu! She was inducted into the American Theater Hall of Fame in 2003. Tammy Grimes worked with a variety of co-stars and playwrights. Noël Coward discovered her in a New York cabaret, and insisted she star in several of his plays. She performed in plays by William Shakespeare and Neil Simon. She guest-starred on TV shows as diverse as Love American Style, Route 66, The Danny Kaye Show, Tarzan, The Love Boat, and The Young Riders. She turned down the chance to play Samantha Stevens on Bewitched (a role which went instead to Elizabeth Montgomery) to concentrate on her stage career. Tammy Grimes acted in mystery, horror, and comedy movies, co-starring over the years with David McCallum, Eddie Albert, William Shatner, Steve Guttenberg, Bernadette Peters, Muppets, mice, and unicorns. Because of her aristocratic accent, she was often cast to play royalty or nobility. Like Katherine Hepburn, Tammy Grimes was taught to speak in the Mid-Atlantic Accent, the American version of British Received Pronunciation beloved by Hollywood, in a girls’ boarding school. Although many fans assumed she was British because of her accent, Tammy Grimes was born in Lynn, Massachusetts on January 30, 1934. She attended Beaver Country Day School in Chestnut Hill, Massachusetts, where she was taught to speak with a Mid-Atlantic Accent, the American version of the British Received Pronunciation that was so popular in Hollywood from the 1930s to the 1950s. She graduated from Stephens College, an all-female school in Columbia, Missouri, before going to New York City to pursue an acting career. Tammy Grimes was thrice married, twice to actors and once to a composer. Her marriages to actor Christopher Plummer, CC, and Jeremy Slate were brief, ending in divorce. Her marriage to composer Richard Bell lasted from their wedding in 1971 to his death in 2005. She had only one child, award-winning actress Amanda Plummer. She is survived by her daughter, her brother Nick Grimes, and her nephew Duncan MacArthur. Are You Looking Forward to MARY POPPINS RETURNS? Hollywood these days seems far more interested in remakes and reboots than in original films and TV shows. December 25, 2018, Disney will be releasing a sequel to its beloved classic Mary Poppins. The new movie is called Mary Poppins Returns, and it’s due for a Christmas release in 2018. 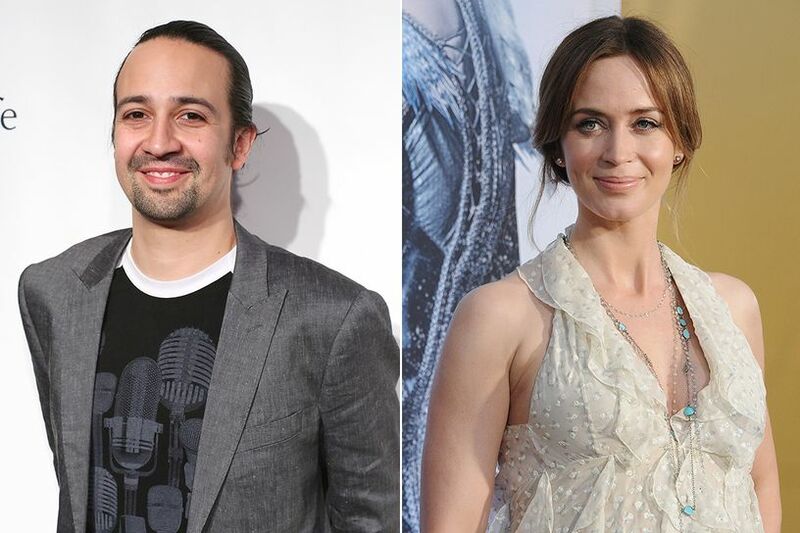 As I reported in The Inquisitr this summer, the sequel will star British actress Emily Blunt as Mary Poppins and Tony-winner Lin-Manuel Miranda as Jack. Many people don’t realize that P. L. Travers wrote more than one Mary Poppins book, or that the literary version of Mary Poppins is very different from her film counterpart. From 1934 to 1988 there were NINE Mary Poppins books, including one cookbook. As shown in the Disney movie Saving Mr. Banks, P. L. Travers (played by Emma Thompson) was dismayed by the changes Walt Disney (played by Tom Hanks) made. The new movie will be directed by Rob Marshall, who directed Pirates of the Caribbean: On Stranger Tides. The songs will be written by Marc Shaiman and Scott Wittman, but it’s far from impossible that rapper/actor/singer/songwriter/scriptwriter Dr. Lin-Manuel Miranda might not collaborate with them to add some lyrics or even a new song. David Magee, the scriptwriter for Finding Neverland, will be writing the script, using Travers’ other Mary Poppins books for material. Mary Poppins Returns will be set during the Depression. Emily Blunt will recreate the role that won Dame Julie Andrews her Academy Award, the “practically perfect” nanny Mary Poppins, come to help a now grown-up Michael Banks with his children. Broadway’s darling, Lin-Manuel Miranda, will be playing Jack, a lamplighter. Mary Poppins, being both magical and “practically perfect in every way,” will (of course) not age from the 1964 Academy Award-winning movie to the sequel in 2018. Some fans think this is because Mary Poppins, like the Doctor, is actually a Time Lord. There are several stories at FanFiction.net exploring this possibility, including one where Mary Poppins is the Doctor’s older sister. 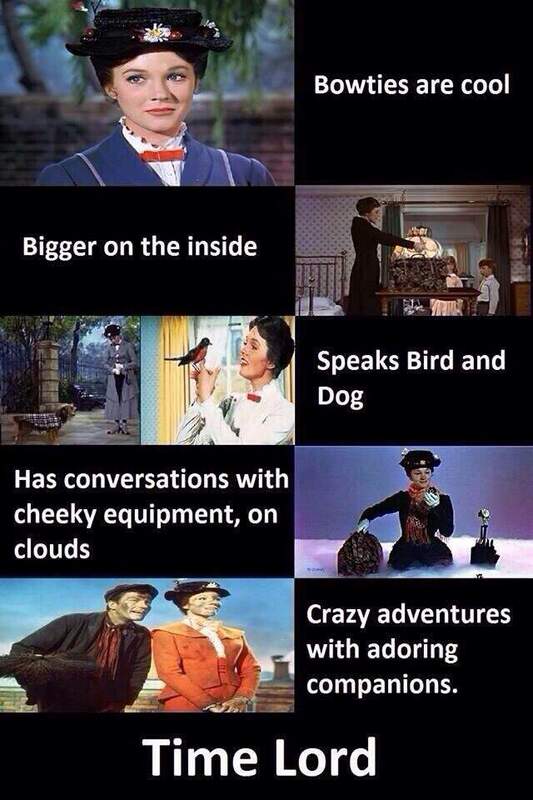 Do you think Mary Poppins is from Gallifrey, or do you think she’s a graduate of Hogwarts? Are you looking forward to seeing Mary Poppins return to London?